qaplay is a small audio player using Qt5 and gstreamer0.10 . It is meant to be used with a filemanager to start playing audio files by clicking on them. qaplay will play all files in a directory if invoked with a directory name containing music files. Otherwise it will play all files following in ascending order in the directory of the song file it was invoked with. 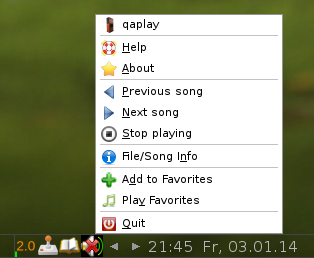 qaplay shows a systemtray icon, which allows to easily stop playing the current song or select the previous or next. This comes handy in case accidentally a long sound file has been started, which otherwise would have to be killed via top. If the playing is not stopped, qaplay will exit at the end of the last file/song of the directory of the song it has been started. The later is shown when hoovering with the mouse cursor over the icon. The menu after right-clicking onto the tray icon. With the right .asoundrc file MPlayer is able to play over pcm (digital/optical out). qaplay only accepts one command line option: the URL of the sound file. qaplay has to be set manually as the default application to handle a specific audio file (mime) type for the file manager. Read more in the online help file, accessible by right-clicking on the trayicon when playing a sound file. * fixed crash playing previous/next file? * added support to play files in directory, will find files automatically, only plays files below sort order.